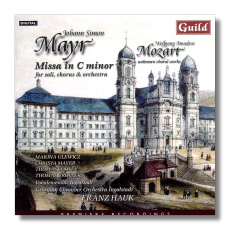 Mayr's music is immediately likeable and tuneful so this recording of his Mass in C Major is extremely welcome. This is a flourishing operatic style piece that is robustly sung by the Ingolstadt forces and the soloists in question. I was particularly fond of the lovely Credo and especially the 'Et Resurexxit' which has a vigour and momentum reminiscent of Beethoven's little C minor Mass. The real gems on disc are the unknown Mozart works, namely a Salve Regina in F Major, 'Quis te comprehendat' in E Flat and 'In te Domine speravi' in E Flat Major. If not top-drawer Mozart these are certainly beautiful pieces of music that are deserving resurrection and in such fine performances as these they take on quite a splendid light. Guild's recording team has again produced an evocative and warmly sympathetic recording whilst the liner notes and superb presentation definitely add to the allure of the disc. Recommended to all lovers of good choral music.